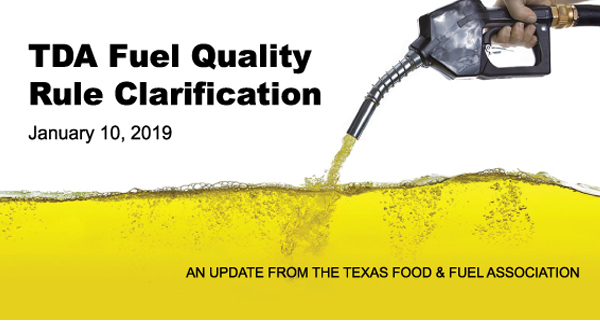 Last week, we notified you about a rule change related to the fuel quality complaint and testing process administered by the Texas Department of Agriculture (TDA). Many TFFA members have inquired about the rule change — this email is intended to provide clarification as we move forward. 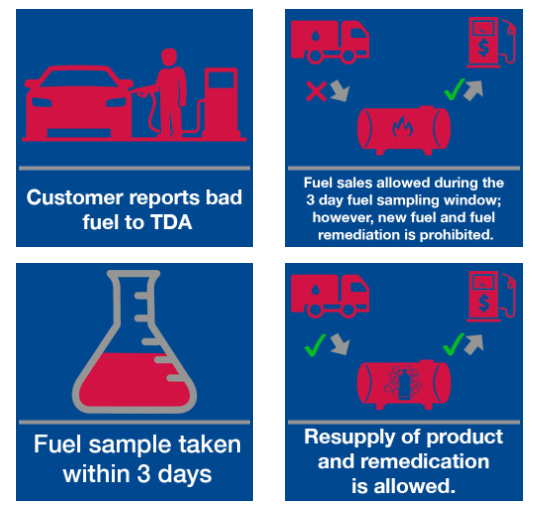 Under TDA’s new rule, once a retailer is notified by TDA of a customer filed fuel quality compliant, the convenience store owner/operator is prohibited from “altering” or “remediating” the fuel prior to having a sample drawn. What exactly does this mean? Simply put, the petroleum storage tanks that contain the fuel in question are prohibited from receiving new fuel and the existing product cannot be cleaned or have additives introduced until the sample(s) have been drawn. During this time, the sale of existing fuel is allowed; however, retailers are required to maintain enough product in their tanks to enable fuel samples be taken from the nozzle. Once the fuel sample(s) have been drawn, new fuel may be added or the existing fuel maybe remediated as necessary. In summary: The newly adopted rule language requires that convenience store owners/operators have a sample drawn and shipped to a TDA approved contracted laboratory within 3 calendar days, beginning the day after the notification. It should be noted — If a retailer receives notice on a Friday; the clock begins and the deadline for pulling the sample would be no later than close of business on the following Monday.